Marsh & Creassey, Houndsgate, Nottingham. This firm was established in 1888 by William Marsh and John Creassey, as Merchants and Agents to deal in all classes of yarns used in the Hosiety, Lace, Glove and kindred trades. In June, 1910, Mr. William Marsh died, and Mr. H. R. Cobbin was taken into partnership, the present partners being J. Creassey and H. R. Cobbin. Owing to continuously increasing trade the present large premises were purchased in November, 1899, and since then loading docks, a winding factory, and garages, etc., have been built, the whole of the buildings covering an area of 1,250 square yards. The principal trade in yarn is done in Cashmere, Wool, Fancy Wool Mixtures, Schappe, and all grades of Cotton yarn for the Hosiery, Lace and Glove trades. 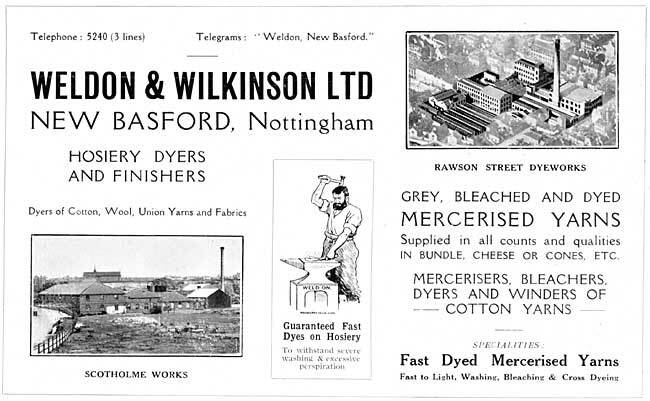 Weldon & Wilkinson Ltd., Hosiery Dyers and Finishers, Hank Mercerisers and Dyers, New Basford, Nottingham. One of the principal and oldest-established concerns in the Midlands is that of Messrs. Weldon & Wilkinson Ltd., of New Basford, Nottingham. They have an extensive establishment devoted to processes contributing towards the hosiery industry. They are Hosiery Dyers and Finishers, Mercerisers of Yarn, and were the first firm in the Midlands to adopt this process. They are also Dyers, Bleachers, and Winders of Cotton Yarn, as well as Dyers of Cotton, Wool, Union Yarns, and Fabrics. Their premises cover a very large area, wherein nearly 1,000 workpeople find employment. The firm was founded in 188S in Rawson Street, on the site of the present dye works. This modern establishment was extended in 1914 by the erection of an extensive factory on the opposite side of the road, the two establishments being joined together by a tunnel. The entire premises are operated by electric power produced by three 150 h.p. generating sets, which also light the entire works. The Company has one of the finest steam generating plants in the Midlands, consuming coal at the rate of 250 tons per week. In 1922 a large works, known as the Scotholme Works, was acquired for extension. Here the firm merchants yarn and has an extensive winding plant, where it also mercerises and dyes for the trade. It specialises in the cross-dye process, and supplies hosiery manufacturers with large quantities of coloured yarns, for patterns and stripes, for fancy half-hose, etc, Another speciality is their Fancy Yarns for embroidering Clocks on Half-Hose. Messrs. Weldon & Wilkinson make a special point of fulfilling the requirements of hosiery manufacturers, who generally have a particular idea of finish, and those who deal with them are always certain of getting their individual tastes or ideas satisfied. Telephones—Rawson Street, 5240-1-2 ; Scotholme Works, 6288-7. Holland & Webb Ltd., Yarn Manufacturers, Weekday Cross, Nottingham. The year 1924 marked the centenary of this firm's foundation. In 1824 Mr. Jackson inaugurated this yarn business and was later joined by Mr. C. A. Holland. On Mr. Jackson's retirement, Mr. Holland, after carrying on alone for a period, entered nto a partnership with Mr. W. F. M. Webb, and the style of the firm was then altered to " Holland & Webb." In 1901 the Company was registered, and the Board at present consists of the following : W. F. M.Weston-Webb (Chairman), Frank Taylor, R. H. Perkins, C. E. Burton, and R. L. Mackley (Directors). Commencing as a private concern 100 years ago, this Company is now one of the most important yarn houses in the country, with blanches at Leicester and Glasgow, and resident representatives in many foreign markets, where they enjoy a reputation for the quality of their goods, and the eliability of their service. Messrs. Holland & Webb Ltd. furnish yarns for every purpose, but specialise in Cotton yarns for Levers' laces, Lace Curtains, Plain Nets, and in both single and folded Cotton yarns (the latter in both plain and gassed and mercerised, and put up either in hank or on cone), suitable for hosiery and underwear manufacturers. In addition, Botany, Worsted, and Union yarns are supplied in both cop form and on cone, and they further produce these yarns folded, in any ply, suitable for knit-goods manufacturers, in both the Home and Export markets. The Company also specializes (particularly for abroad), in all classes of Cotton yarns for weaving, doubling and insulating. Their registered offices are situate in Weekday Cross, Nottingham, in the very heart of the well-known Lace Market. Telephones—Local : 2251 to 2253. Trunk: 3742 & 3747 (five lines). Telegrams—"Rock," Nottingham and Leicester ; "Holweb," Glasgow. I. & R. Morley, Nottingham. The firm of I. & R Morley, which is famous for its hosiery, underwear and gloves, which are sent to all parts of the world, has been established for nearly 150 years. It was founded by John and Richard Morley in Nottingham. Towards the end of the 18th century, offices and warehouses were opened in London in Russia Row, and afterwards trans­ferred to 18 Wood Street, the present headquarters of the firm, and one of the most important business sites in the city of London occupying long frontages in Wood Street, Gresham Street and Milk Street. The large factory-warehouse at Fletcher Gate, Nottingham, acts as collecting centre for many of the factories, from which goods are despatched to London and Liverpool for shipment. The greatness of the Firm is due in no small measure to Mr. Samuel Morley, who added to his genius for business, qualities of statesmanship and humanity which left their mark on the country's history. It was largely through him that the great manufacturing resources of the firm were developed. Factories were opened in Nottingham at Handel Street, Man vers Street and Daybrook, and in four neighbouring centres, Heanor, Leicester, Loughborough and Sutton. More recently a large factory for shirts, ties and umbrellas, has been opened in London, and a glove factory in Worcester. The business of the firm is world-wide, and for this reason represents one of the basic industries of England. 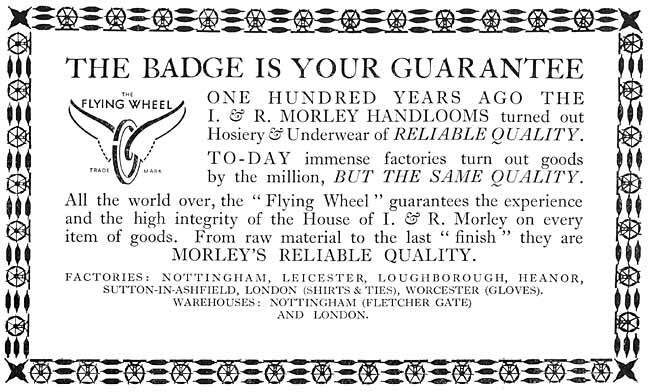 The Flying Wheel is the trade mark. The present heads of the firm are the Hon. Geoffrey Hope-Morley, the Hon. Claude Hope-Morley, and Mr. Charles Morley, all three of whom are grandsons of the late Mr. Samuel Morley. Telephone—London Wall 0121.; Nottingham 2588. Geo. 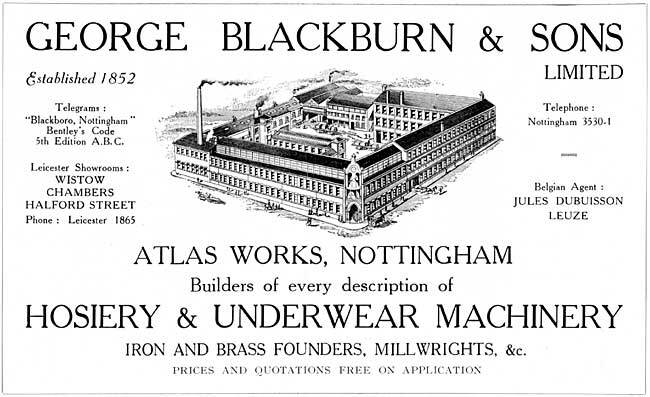 Blackburn & Sons Ltd., Manufacturers and Suppliers of Hosiery Machinery and Accessories, Nottingham. It is not surprising that Nottingham, the principal centre in England for the manufacture of lace and the hosiery industry, should be the home of what is undoubtedly one of the largest manufactories of Hosiery Machinery in the country. This huge concern was established right back in 1852 when it was founded for the manufacture of Loop Wheel, Run-up Rib and Winding Machines. It is a striking testimony to the efficiency of the business and the superiority of the class of machinery and accessories turned out, that it has maintained a premier position throughout its existence, covering three-quarters of a century of constant and rapid improvements, revolutionizing inventions and ever-growing keener competition. To-day, Blackburn's supply markets all over the world and their specialities enjoy a reputation second to none, having won recognition and valuable awards from time to time at important public exhibitions. Space necessarily precludes even a catalogue of the numerous lines in which this enterprising firm specializes, but mention might be made of the well-known Circular Latch-Needle Web Machine which has completely revolutionized the production of web fabric, producing fine gauge fabric in silk or artificial silk (plain or fancy) and plating of an exceptionally fine character. Another outstanding innovation is the perfection of two models of Seamless Machines for the manufacture of endless patterns in silk and artificial silk hose. Among other outstanding features of the business may be mentioned the Auxiliary Machinery Section for the production of winders for all classes of cotton, wool, silk and artificial silk, which also embraces the production of all types of needles and spare parts for the hosiery manufacturer. Also special departments for the manufacture of shafting, gearing, pulleys, etc. ; an Iron and Brass foundry; a Repairs Department; with extensive Show Rooms at 12, Halford Street, Leicester. In a highly technical business such as this very close attention must be given to production and improvements in detail, for it is surprising how, in such delicate apparatus as knitting machinery, even a slight improvement may open up an entirely new field of production. The firm's operations are so extensive that they may be said to have exhausted all the possibilities of their own particular field of manufacture. So far as the machines which they design and construct are concerned, a standard is maintained throughout which is the highest possible in efficiency, and by this means is fully justified that general confidence with the firm's products which is expressed by the various industries which they supply. To the widespread distribution of Messrs. George Blackburn & Sons' machines, and the high reputation they bear abroad, as well as at home, there is testimony in the substantial connections that have been developed during many years past all over the country, and in the chief centres of export trade.